I'm so happy its not raining today! These hot colors are lovely anytime of year, but for the Fall that velvet sofa is perfect for cuddling. In other news, the winner of the Tickle Your Nose Giveaway was chosen and the lucky gal is... Cristin from Simplified Bee. Congrats Cristin, enjoy all your Paddywax goodies! Also, the super talented Janell from Isabella & Max Rooms put together a list of her favorite blogland DIY projects and I feel so honored she chose my chevron tray. Thank you Janell! Love that eggplant sofa! Very chic indeed. And congrats on being included in Janell's list -- I loved that tray! wooo what a colourful energy! Soooo glad it's almost Friday!! Your chevron tray is such a cute project - congrats! I am sooo excited! Thank you so much. 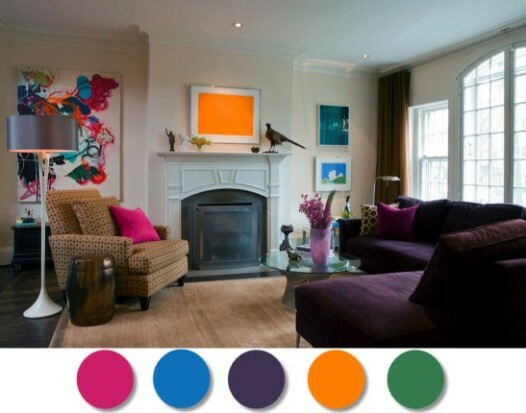 what a fun color scheme, that painting is incredible! I love that living room like crazy and the trays are super!